Right now there is an empty wall behind the bar, but this is what it looked like for decades. Kyo-ya Hotel management now says it will not sell Maxfield Parrish’s The Pied Piper painting. 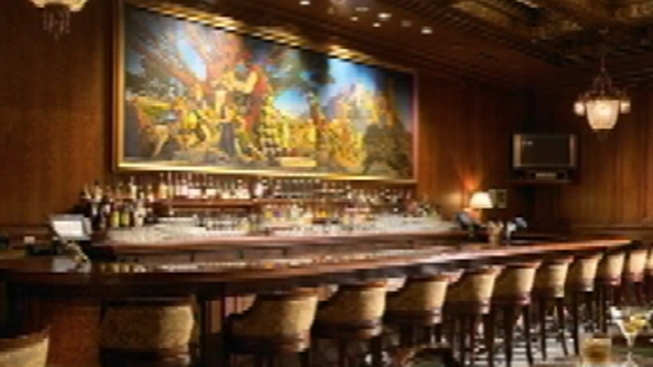 The mural, titled "The Pied Piper of Hamelin," has been on display at the bar of The Palace Hotel for more than 100 years. Last week came the news that the hotel was going to put it up for auction at Christie's. Apparently, the outcry that followed was loud enough to make a difference. Kyo-ya Hotels owns the hotel which is located at Market and New Montgomery streets. Kyo-ya issued a release Monday that said in part, "Given the local community’s affection for Maxfield Parrish’s The Pied Piper painting, Kyo-ya Hotels and Resorts, owners of The Palace Hotel, have reconsidered the sale of the beloved piece, which will remain on property." It did not guarantee the painting would return to the exact spot over the main bar. The painting is no longer on display at the bar. The location might not have been the best spot for a masterpiece anyway. It reportedly had both smoke and liquid stains. Apparently the reaction came not only from the public, but from City Hall. The Kyo-ya release said it had consulted with San Francisco Mayor Ed Lee "to ensure that the interests of the residents of San Francisco were instrumental in this decision." The painting is one of San Francisco's little known cultural treasures. It is valued between $3 million and $5 million. It is the work of Maxfield Parrist, who is a famous American artist from the first half of tht 20th Century.